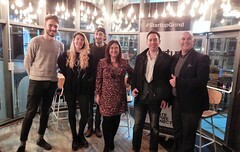 Startup Grind Cardiff brings local entrepreneurs together, to inspire, network and grow. With inspiring stories by our speaker and memorable quality events. Born in Reggio Calabria, Italy and brought up in Grangetown, Cardiff – Giovanni is a true Welsh Italian. His career began with him travelling to America to work on luxury cruise liners touring the world. His first business venture was in New Jersey where he purchased shares in a restaurant called The Fox and Hounds, which he successfully ran for a number of years before becoming homesick and returning to Wales. Six months after his return, while looking for a new project, he came across a coffee shop then known as ‘Planters’, which is now the iconic Giovanni’s Restaurant on the Hayes. Having played host to countless celebrities, appearing on various TV shows and receiving outstanding reviews – it truly can be said that Giovanni’s restaurant is a Cardiff institution. 2013 marked the 30th anniversary of its trading, and Giovanni is now spreading his wealth of knowledge with his second Cardiff restaurant “Giovannis in Park Place” and his highly anticipated Italian Cookery School. And as if his year hadn’t already been busy enough, he isn’t stopping there. He has plans to open Giovanni’s Central Kitchen, and launch his very own Italian Delivery Service alongside his restaurants. While Giovanni’s first love is food, his interests and expertise doesn’t stop there. Giovanni is incredibly skilled at helping others which is reflected in his work as a life coach. On top of this, he is also the founder of GIOS charity, standing for “Great Individuals Often Succeed” and generates funds to assist youths in achieving their dreams. 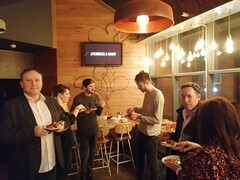 Startup Grind is the largest independent startup community, actively educating, inspiring, and connecting 1,000,000 entrepreneurs in over 200 cities. We nurture startup ecosystems in 98 countries through events, media, and partnerships with organizations like Google for Entrepreneurs. The cornerstone of our global community are monthly events featuring successful local founders, innovators, educators and investors who share lessons learned on the road to building great companies. Founded in Silicon Valley, Startup Grind has now hosted 5,000 fireside chats since its founding in 2010. 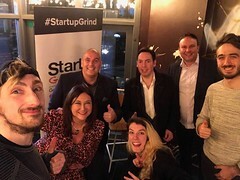 To date, Startup Grind has helped millions of entrepreneurs find mentoring, connect to partners and hires, pursue funding, and reach new users. Responsible for growing and developing the KTN’s strategies for assisting innovative companies through the application and raising of finance be-it lending, grants, or equity based. Raised finance, won grants, gain sales and grown management teams. 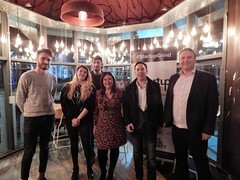 Co-created the UK Innovation Forum, to find the management required by UK research institutions to fill posts in their spinouts, or otherwise participate in the commercialisation of new technologies.